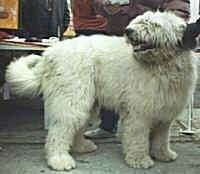 The Mioritic Sheepdog has a massive body that is fully covered with abundant long and fluffy, light colored hair. The head is massive; the skull is broad, slightly arched; the stop is not clearly marked; the muzzle is strong, tapering gradually on to the nose; length of the muzzle shorter than the length of the skull. The occipital bone is large and pronounced. The nose is well developed, broad and black. Strong and complete scissors bite. The ears are not very big, set rather high, triangular, hanging on each side of the head. The eyes are medium size, slightly oval shaped, amber or hazel in color. The neck is muscular and massive, medium length. The body is rectangular, moderate length; the back is firm, broad and muscled; loins are broad, the croup is not falling away. Brisket is broad and deep, reaching to the elbows; the chest is broad, moderately pronounced. The shoulders are broad. The elbows are massive, arched, in the same plane with the flanks; the forearm is straight, very vigorous with oval, massive and compact toes. Seen from any angle, the forearms are straight, vertically placed on the ground. Seen from the rear, the hind legs are parallel. Seen from side, the angulation from upper to lower thigh is well marked; both upper and lower thigh are long and muscled; hock joints are not very high, hock is almost perpendicular on the ground; hind feet oval, well developed, with compact toes. The tail is set on high; in repose hanging down, reaching to the hocks; the tip of the tail is lightly curved. When the dog is in action, the tail is carried high, up to the height of the back but without being bent over it. The coat is long with abundant hair covering the entire body, including the head and the feet; top coat slightly wavy, rough, long, measuring 3.15-6.3 inch (8-16 cm); the undercoat is dense and smooth. The basic color is usually white, lightly cream or pale gray, sometimes with patches of these colors. Gray colored skin is preferred. It is entirely possible for one litter to have a mix of pure white and grey/white dogs. The ears and tail may be cropped. The Mioritic Sheepdog is vivid and balanced; alert and vigilant, disciplined and very attached to its owner, but suspicious with strangers. Fearless and very courageous, he is the perfect protector of his owner and the herds. He is a vigilant, courageous and dominant dog, though he obeys his owner with calm and discipline. An incorruptible guard and a wonderful pet. A very goodflock guard, very brave and an efficient fighter against possible attackers (bear, wolf, lynx). When raised as a working livestock guardian it will not be trustworthy with unknown people. It loves children very much. The objective in training this dog is to achieve pack leader status. It is a natural instinct for a dog to have an order in its pack. When we humans live with dogs, we become their pack. The entire pack cooperates under a single leader. Lines are clearly defined and rules are set. Because a dog communicates his displeasure with growling and eventually biting, all other humans MUST be higher up in the order than the dog. The humans must be the ones making the decisions, not the dogs. That is the only way your relationship with your dog can be a complete success. Prone to hip dysplasia, skin problems and ear infections. 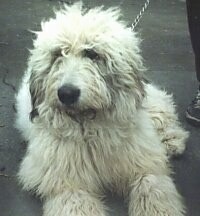 An adult Mioritic Sheepdog needs plenty of space to run around with a large backyard. They love to play, just let them outside. This breed needs physical exercise. They need to be taken on a daily, long, brisk walk or jog. While out on the walk the dog must be made to heel beside or behind the person holding the lead, as in a dog's mind the leader leads the way, and that leader needs to be the human. In addition, they will benefit from a large, safe area where they can run free. The coarse, longhaired coat needs constant care to keep it in top condition. Unless it is combed and brushed right through to the dense, waterproof undercoat at least three times per week, it will become matted and the dog may develop skin problems, making it prone to host parasites. Clip out any tangles carefully so as not to nick the skin. If the dog is not being shown, the coat can be clipped every two months or so, about one inch all the way around. Trim around the eyes and rear-end with blunt-nosed scissors. This breed sheds like a human—not a lot, but in small amounts. This large size shepherd dog originated Carpathian mountains in Romania. The Mioritic Shepherd Dog was selected out of a natural breed that exists in the Carpathians, the main reason being its utility. 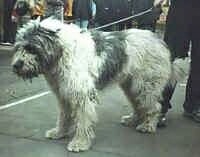 Thanks to its vigorous appearance, this breed has many fans in Romania. 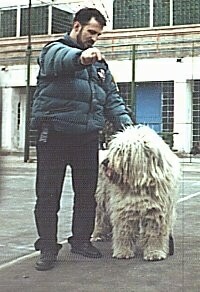 The standard was elaborated by The Asociatia Chinologica Romana (Romanian Kennel Club) in 1981. The technical commission of A.Ch.R (RKC) adapted and revised the standard on February 29, 2002, according to the pattern made by FCI at Jerusalem.